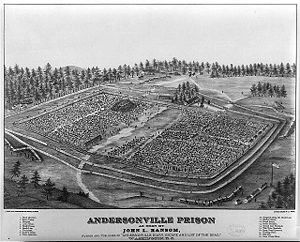 The Andersonville prison, located at Camp Sumter, was the largest Confederate military prison during the American Civil War. The site of the prison is now Andersonville National Historic Site in Andersonville, Georgia. It includes the site of the Civil War prison, the Andersonville National Cemetery, and the National Prisoner of War Museum. 12,913 Union prisoners died there, mostly of diseases. Controversy, however, has surrounded the cause of the death of so many prisoners, including the charge that war crimes were perpetrated. One legacy of the prison was the consolidation in the North of a sense of moral superiority over the South, that the right, the more human side, won the bitter struggle that was the American Civil War. This view, however, made the task of post-war Reconstruction more difficult, underlying differences in the ethos and culture of the Northern and Southern states. Early in the American Civil War, prisoners were commonly paroled and sent home to await a formal exchange before they could return to active service. After an incident at Fort Pillow in Tennessee, during which Confederate General Nathan Bedford Forrest's troops executed a group of black Union troops after their surrender, Union General Ulysses S. Grant voided that policy on the Union's part, and Federal authorities began to hold Confederate captives in formal prison camps rather than paroling them, until the Confederacy pledged to treat white and black Union soldiers alike. As result, Confederate President Jefferson Davis and General Robert E. Lee refused this proposal and Confederate military and political leaders began to likewise construct prison camps to hold Union prisoners. Maj. Gen. Howell Cobb, former governor of Georgia, suggested the interior of that state as a possible location for these new camps since it was thought to be quite far from the front lines and would be relatively immune to Federal cavalry raids. A site was selected in Sumter County by Captain W. Sidney Winder and the new prison opened in February 1864. The prison encompassed 16.5 acres and the was enclosed with pine logs. Water was supplied by a stream that cut through the camp. Prisoners began arriving at the camp before it had been fully constructed. In mid-1864 the area was enlarged to 26 acres to hold in excess of 23,000 soldiers. Because of the scarce resources of the Confederacy, Andersonville prison was frequently short of food, and even when this was sufficient in quantity, it was of a poor quality and poorly prepared on account of the lack of cooking utensils. The water supply, deemed ample when the prison was planned, became polluted under the congested conditions. Sanitation was lax and feces and other waste products dumped upstream often traveled to soldiers drinking the water lower down. By August 1864, the number of prisoners reached 33,000, a number far too large for the prison to support. A swamp was created by men standing near the river and soon became the site of the lavatory. It quickly evolved into a breeding ground for disease and developed a fetid odor that permeated the camp. During the summer of 1864, the prisoners suffered greatly from hunger, exposure, and disease, and in seven months about a third of them died from dysentery and were buried in mass graves, the usual procedure there. Many guards of Andersonville also died for the same reasons as the prisoners—however, it is highly debated whether these deaths were the same as the others or if they were from common factors in the American Civil War, such as trench foot. Scurvy, undernourishment, and foodborne illnesses also contributed to the high number of prison deaths. At Andersonville, a light fence known as the deadline was erected approximately 19-25 feet (5.8-7.6 m) inside the stockade wall to demarcate a no-man's land keeping the prisoners away from the stockade wall. Anyone crossing this line was shot by sentries posted at intervals around the stockade wall. The guards, disease, starvation, and exposure were not all that prisoners had to deal with. Because the Confederacy lacked sufficient manpower, guards were put in place only to prevent escape, not to provide any internal order. A group of prisoners, organized by Pennsylvanian William "Mosby" Collins and calling themselves the "Raiders," attacked their fellow inmates to steal food, jewelery, money, or even clothing. They were armed mostly with clubs, and even killed to get what they wanted. Several months later, another group rose up to stop the larceny, calling themselves "Regulators." They caught nearly all of the "Raiders" and these were tried by a judge (Peter "Big Pete" McCullough) and jury selected from a group of new prisoners. This jury upon finding the "Raiders" guilty set punishment upon them. These included running the gauntlet (this entailed running through an area lined by two groups of men armed with clubs; three died as a result), being sent to the stocks, ball and chain, and, in six cases, hanging. In the autumn, after the capture of Atlanta, all the prisoners who could be moved were sent to Millen, Georgia, and Florence, South Carolina. By December, only 1,359 were left. At Millen, better arrangements prevailed, and when, after General William Tecumseh Sherman began his march to the sea, the prisoners were returned to Andersonville, the conditions there were somewhat improved. After the war, Henry Wirz, the Swiss-born superintendent, was tried by a court-martial featuring chief JAG prosecutor Norton Parker Chipman on charges of conspiracy and murder. He was found guilty of conspiracy and of all but two counts of murder (for a total of 11). He requested clemency from President Johnson, but was not answered. 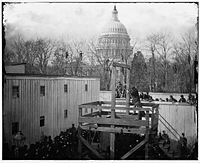 On November 10, 1865, he was hanged. Some debate the fairness of his trial and claim that inmates who detested the man may have embellished their accounts of his brutality. Wirz was the only prominent Confederate to have his trial heard and concluded (even the prosecution for Jefferson Davis dropped their case). The revelation of the sufferings of the prisoners was one of the factors that shaped public opinion regarding the South in the Northern states, after the close of the Civil War. The prisoners' burial ground at Andersonville has been made a national cemetery and contains 13,714 graves, of which 921 are marked "unknown." In 1891, the Grand Army of the Republic, Department of Georgia, bought the site of Andersonville Prison from membership and subscriptions from the North. The site was purchased by the Federal Government in 1910. A 395 acre tract was designated the Andersonville National Historic Site. During the war, almost 45,000 prisoners were received at the Andersonville prison, and of these 12,913 died (40 percent of all the Union prisoners that died throughout the South). A continual controversy among historians is the nature of the deaths and the reasons for them. Some contend that it constituted deliberate Confederate war crimes toward Union prisoners; while others contend that it was merely the result of disease (promoted by severe overcrowding), the shortage of food in the Confederate States, the incompetence of the prison officials, and the refusal of the Confederate authorities to parole black soldiers, resulting in the imprisonment of soldiers from both sides, thus overfilling the stockade. ↑ Alicia Rodriguez, "Andersonville," in Encyclopedia of the American Civil War: A Political, Social, and Military History, eds. David S. Heidler and Jeanne T. Heidler (New York: W. W. Norton & Company, 2000), 48-49. ↑ National Park Service, Life as a Prisoner. Retrieved October 12, 2007. ↑ Grand Army of the Republic. Dept. of Georgia, Roster and History of the Department of Georgia (States of Georgia and South Carolina) Grand Army of the Republic (Atlanta: Syl. Lester & Co. Printers, 1894), 5. ↑ National Park Service, History & Culture. Retrieved October 12, 2007. Grand Army of the Republic. Dept. of Georgia. Roster and History of the Department of Georgia (States of Georgia and South Carolina) Grand Army of the Republic. Atlanta, GA: Syl. Lester & Co. Printers. National Park Service. History & Culture. Retrieved October 12, 2007. National Park Service. 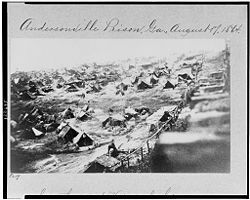 Andersonville: Prisoner of War Camp. Life as a Prisoner Retrieved October 12, 2007. Rhodes, James Ford. 1864-1865. Vol. 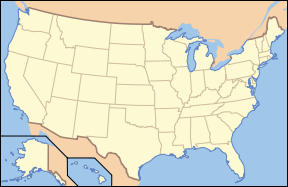 5, History of the United States. New York, NY: MacMillan and Company, 1904. Andersonville: Prisoner of War Camp National Park Service's Teaching with Historic Places. This page was last modified on 20 March 2016, at 18:55.